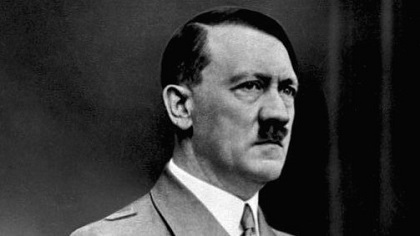 Adolf Hitler was born in the Austrian border town of Braunau am Inn in 1889. When he was seventeen, he was refused admission to the Vienna Art Academy, having been found insufficiently talented. He remained in Vienna, however, where he led a bohemian existence, acquiring an ideology based on belief in a German master race that was threatened by an international Jewish conspiracy responsible for many of the world’s problems. Hitler remained in Vienna until 1913, when he moved to Munich. After serving with bravery in the German army during World War I, he joined the right-wing Bavarian German Workers’ Party in 1919. The following year, the party changed its name to the National Socialist German Workers’ Party (National-Sozialistische Deutsche Arbeiterpartei–NSDAP). Its members were known as Nazis, a term derived from the German pronunciation of “National.” In 1921 Hitler assumed leadership of the NSDAP. As leader of the NSDAP, Adolf Hitler reorganized the party and encouraged the assimilation of other radical right-wing groups. Gangs of unemployed demobilized soldiers were gathered under the command of a former army officer, Ernst Roehm, to form the Storm Troops (Sturmabteilung–SA), Hitler’s private army. Under Hitler’s leadership, the NSDAP joined with others on the right in denouncing the Weimar Republic and the “November criminals” who had signed the Treaty of Versailles. The postwar economic slump won the party a following among unemployed ex-soldiers, the lower middle class, and small farmers; in 1923 membership totaled about 55,000. General Ludendorff supported the former corporal in the Beer Hall Putsch of November 1923 in Munich, an attempt to overthrow the Bavarian government. The putsch failed, and Hitler received a light sentence of five years, of which he served less than one. Incarcerated in relative comfort, he wrote Mein Kampf (My Struggle), in which he set out his long-term political aims. After the failure of the putsch, Hitler turned to “legal revolution” as the means to power and chose two parallel paths to take the Nazis to that goal. First, the NSDAP would employ propaganda to create a national mass party capable of coming to power through electoral successes. Second, the party would develop a bureaucratic structure and prepare itself to assume roles in government. Beginning in the mid-1920s, Nazi groups sprang up in other parts of Germany. In 1927 the NSDAP organized the first Nuremberg party congress, a mass political rally. By 1928 party membership exceeded 100,000; the Nazis, however, polled only 2.6 percent of the vote in the Reichstag elections in May. A mere splinter party in 1928, the NSDAP became better known the following year when it formed an alliance with the DNVP to launch a plebiscite against the Young Plan on the issue of reparations. The DNVP’s leader, Alfred Hugenberg, owner of a large newspaper chain, considered Hitler’s spellbinding oratory a useful means of attracting votes. The DNVP-NSDAP union brought the NSDAP within the framework of a socially influential coalition of the antirepublican right. As a result, Hitler’s party acquired respectability and access to wealthy contributors. Had it not been for the economic collapse that began with the Wall Street stock market crash of October 1929, Hitler probably would not have come to power. The Great Depression hit Germany hard because the German economy’s well-being depended on short-term loans from the United States. Once these loans were recalled, Germany was devastated. Unemployment went from 8.5 percent in 1929 to 14 percent in 1930, to 21.9 percent in 1931, and, at its peak, to 29.9 percent in 1932. Compounding the effects of the Depression were the drastic economic measures taken by Center Party politician Heinrich Bruening, who served as chancellor from March 1930 until the end of May 1932. Bruening’s budget cuts were designed to cause so much misery that the Allies would excuse Germany from making any further reparations payments. In this at least, Bruening succeeded. United States president Herbert Hoover declared a “reparations moratorium” in 1932. In the meantime, the Depression deepened, and social discontent intensified to the point that Germany seemed on the verge of civil war. In times of desperation, voters are ready for extreme solutions, and the NSDAP exploited the situation. Skilled Nazi propagandist Joseph Goebbels launched an intensive media campaign that ceaselessly expounded a few simple notions until even the dullest voter knew Hitler’s basic program. The party’s program was broad and general enough to appeal to many unemployed people, farmers, white-collar workers, members of the middle class who had been hurt by the Depression or had lost status since the end of World War I, and young people eager to dedicate themselves to nationalist ideals. If voters were not drawn to some aspects of the party platform, they might agree with others. Like other right-wing groups, the party blamed the Treaty of Versailles and reparations for the developing crisis. 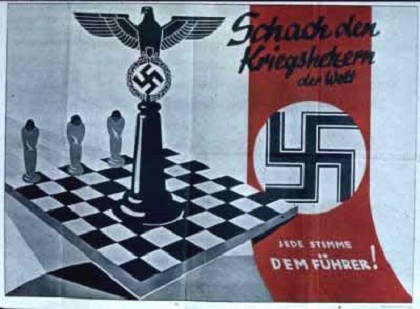 Nazi propaganda attacked the Weimar political system, the “November criminals,” Marxists, internationalists, and Jews. Besides promising a solution to the economic crisis, the NSDAP offered the German people a sense of national pride and the promise of restored order. Three elections–in September 1930, in July 1932, and in November 1932–were held between the onset of the Depression and Hitler’s appointment as chancellor in January 1933. The vote shares of the SPD and the Center Party fluctuated somewhat yet remained much as they had been in 1928, when the SPD held a large plurality of 153 seats in the Reichstag and the Center Party held sixty-one, third after the DNVP’s seventy-three seats. The shares of the parties of the extreme left and extreme right, the KPD and the NSDAP, respectively, increased dramatically in this period, KPD holdings almost doubling from fifty-four in 1928 to 100 in November 1932. The NSDAP’s success was even greater. Beginning with twelve seats in 1928, the Nazis increased their delegation seats nearly tenfold, to 107 seats in 1930. They doubled their holdings to 230 in the summer of 1932. 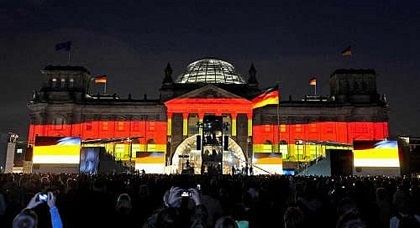 This made the NSDAP the largest party in the Reichstag, far surpassing the SPD with its 133 seats. The gains of the NSDAP came at the expense of the other right-wing parties. Chancellor Bruening was unable to secure parliamentary majorities for his austerity policy, so he ruled by decree, a right given him by President Hindenburg. Head of the German army during World War I, Hindenburg had been elected president in 1925. Ruling without parliament was a major step in moving away from parliamentary democracy and had the approval of many on the right. Many historians see this development as part of a strategic plan formulated at the time by elements of the conservative establishment to abolish the republic and replace it with an authoritarian regime. By late May 1932, Hindenburg had found Bruening insufficiently pliable and named a more conservative politician, Franz von Papen, as his successor. After the mid-1932 elections that made the NSDAP Germany’s largest party, Papen sought to harness Hitler for the purposes of traditional conservatives by offering him the post of vice chancellor in a new cabinet. Hitler refused this offer, demanding the chancellorship instead. General Kurt von Schleicher, a master intriguer and a leader of the conservative campaign to abolish the republic, convinced Hindenburg to dismiss Papen. Schleicher formed a new government in December but lost Hindenburg’s support within a month. 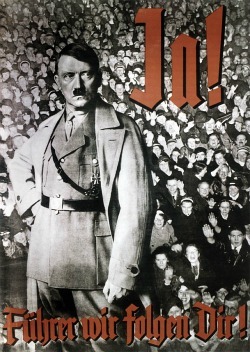 On January 30, 1933, Papen again put together a cabinet, this time with Hitler as chancellor. Papen and other conservatives thought they could tame Hitler by tying him down with the responsibilities of government and transferring to themselves his tremendous popularity with a large portion of the electorate. But they proved no match for his ruthlessness and his genius at knowing how–and when–to seize power. Within two months, Hitler had dictatorial control over Germany.